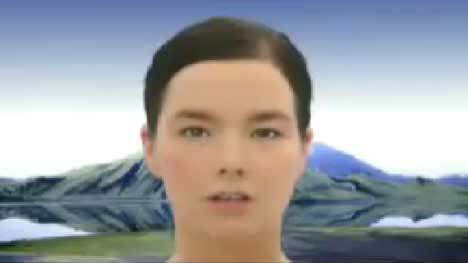 Bjork and One Little Indian have released the music video for Earth Intruders, the first single from Bjork‘s forthcoming album Volta. 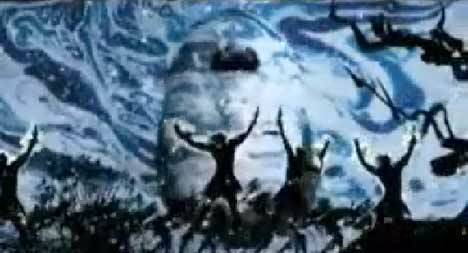 The Earth Intruders music video, directed by French animator Michel Ocelot, features animated silhouetted figures dancing and marching to a percussive track while Bjork’s face appears large in the horizon. According to an interview Bjork did with Pitchfork, the song was inspired by a 2005 trip to post-tsunami Indonesia. She was inspired to think about the human race as “a tribe” marching to a universal beat. Bjork met with Timbaland straight after her time in Indonesia. Earth Intruders includes a metallic industrial beat produced by North American hip hop composer/producer Timbaland and tribal percussion by the African group Konono No 1. Bjork approached Michel Ocelot, inspired by his work in the 1998 hit Kirikou et la sorcière (Kirikou and the Sorceress) set in an African village. In a little village somewhere in Africa, a boy named Kirikou is born. But he’s not a normal boy, because he knows what he wants and can already speak and walk. His mother tells him how an evil sorceress has dried up their spring and devoured all the males of the village except for one last warrior. Kirikou decides to accompany the warrior to the spring to challenge the sorceress. Filming was shot by director Michel Ocelot via Nord-Ouest with producer Christophe Rossignon, first assistant directors Anne Lisse Lourdelet-Koehler and Eric Serre, executive producer Eve Francois Machuel. Visual effects were produced at Mac Guff by VFX supervisor Sebastien Rey, executive producer Alexandra Added, flame artist Fabien Coupez, creative team Michael Armelino, Christophe Barnouin, Yoann Copinet, Antoine Douadi, Karine Ferron, Yurik Figueroa, Damien Gaillardon, Jérôme Gordon, Soline Guyonneau, Amelie Guyot, Thomas Jacquet, Peregrine Mccafferty, and Florence Pernet, and technical director Max Tourret.